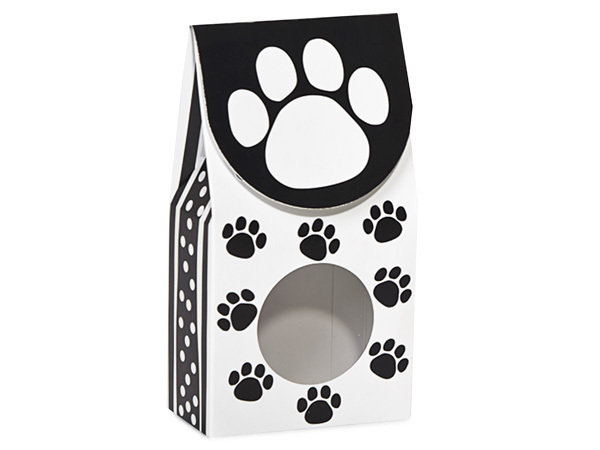 Small size black and white paw print gourmet window boxes have a black stripes with white polka dots on the side. The fold over top has a large white paw print on a black background with hook and loop lid fastener. Each box has 2" clear acetate windows to show off your product. Great for pet treats & gifts! Gourmet window gift boxes are available in solid colors, kraft, and printed designs. Hook and loop closures holds the die cut fold over flap closed. Small size has a 2" round acetate window. Large size has a 2-1/2x3" oval acetate window. Just fill the box and fold over. We recommend a food safe barrier such as a clear cello sheet, cello bag, or waxed food grade tissue.